Which lapel should you have on your suit? WHEN tailoring a new suit, you might be asked about the colour or how many buttons you want. But an often-overlooked element that’s just as important is the lapel. What is a lapel? This piece of folded fabric on a suit is the continuation of the collar that goes down the front side of a blazer along the neckline. To an untrained eye, there’s little distinction between different types of lapels. However, each lapel style will give a different formality to your look. If you’re looking to level up your sartorial game this year, why not start with a quick lesson on lapels right here with us? Keep reading on as we take you through a handy guide to lapels. A notch lapel is the most common lapel you’ll see on suit blazers everywhere. Its trait is a sideways ‘V’ shape on both sides of the jacket. This classic and traditional lapel style is super versatile, as it isn’t too distracting and lets you blend in effortlessly (in a good way) with your peers. You can wear it both in a smart casual outfit or with a formal three-piece ensemble. However, it might not be suitable for extremely formal events, like white-tie dinners or gala evenings. A peak lapel marks the gold standard of a power suit—have you seen Harvey Specter of Suits without one? It’s characterised by the “peak” in the lapel that juts up and towards the shoulder. There’s honestly no way you can dress down a suit with a peak lapel unless you’re going out of your way for a costume party. It also gives an advantage to those of us who are vertically-challenged by drawing the eyes to the shoulders, giving the illusion of looking taller. While it can be worn on both single and double-breasted suits, there are still some guidelines when tailoring a peak lapel. The first–and arguably most important–is that the width of the peak should not be too wide, else you risk looking like a clown. If you’re dressing to impress, a jacket with a shawl lapel is your best friend. Unlike the angular cuts in the notch and peak lapels, a shawl lapel is smooth-edged all the way down to the first suit button. Aside from wool, this variation also comes in luxurious fabrics like velvet or satin. Mr Tom Ford is probably the de facto designer to go to when it comes to tuxedos with shawl lapels. This is the highest standard of lapels and should only be worn for formal events (read: gala dinners or anything with the word black-tie in the invitation). So please don’t make a fashion faux pas by wearing it to a casual date night. This is our disclaimer absolving us of any blame. 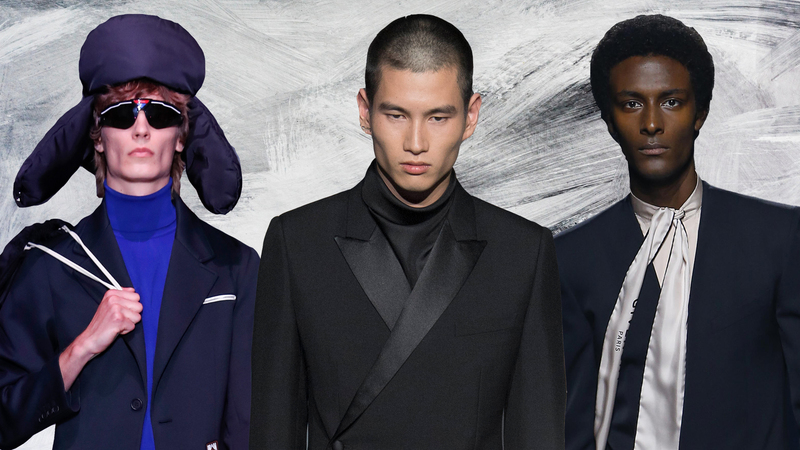 On the Givenchy Spring 2019 runway, Clare Waight Keller decided to break the status quo and send out three models wearing suits with no lapels. Yes, there were no illusions or tricks. It takes some getting used to, as the mind tries to categorise this style into the formal or informal box. In one fell swoop, Keller has managed to challenge the traditions of menswear simply by going “less is more.” Will it stick and appear in other menswear collections in the future? We’ll be keeping an eye out.